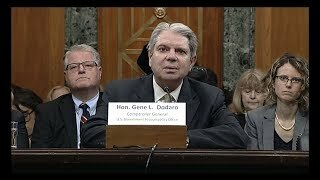 In his May 23, 2018, testimony to the U.S. Senate, Comptroller General Gene Dodaro discusses GAO's 2018 Duplication and Cost Savings Report. 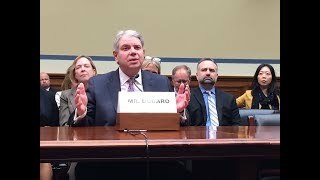 In his April 26, 2018, testimony to the U.S. House of Representatives, Comptroller General Gene Dodaro introduces GAO's 2018 Duplication and Cost Savings Report. Every year, we identify and report on federal agencies, programs, and initiatives with fragmented, overlapping, or duplicative goals or activities; and ways to reduce costs or enhance revenue. The government saves money when it takes the actions we've proposed—saving an estimated $178 billion so far by fully or partially addressing 76% of our recommendations. In our 8th annual report, we identified 68 new actions that Congress and executive branch agencies could take to improve operations across government. Fully addressing these and remaining actions from our prior reports could lead to tens of billions of dollars of additional savings. A summary figure highlighting numbers of new recommended actions and the status of prior actions. Congress could consider modifying tobacco tax rates to eliminate significant tax differentials between similar products to address future revenue losses caused by manufacturers and consumers substituting tobacco products. Federal losses ranged from $2.6 to 3.7 billion between April 2009 and February 2014. The federal government faces a long-term, unsustainable fiscal path based on an imbalance between federal revenues and spending. While addressing this imbalance will require fiscal policy changes, in the near term opportunities exist in a number of areas to improve this situation, including where federal programs or activities are fragmented, overlapping, or duplicative. To call attention to these opportunities, Congress included a provision in statute for GAO to identify and report on federal programs, agencies, offices, and initiatives—either within departments or government-wide—that have duplicative goals or activities. GAO also identifies areas that are fragmented or overlapping and additional opportunities to achieve cost savings or enhance revenue collection. This report is its eighth in this series. examples of open actions directed to Congress or executive branch agencies. To identify what actions exist to address these issues, GAO reviewed and updated prior work, including recommendations for executive action and matters for congressional consideration. For more information, contact Jessica Lucas-Judy at (202) 512-9110 or lucasjudyj@gao.gov or J. Christopher Mihm at (202) 512-6806 or mihmj@gao.gov.